If you've been working out diligently to find that one side of your chest is noticeably better-developed than the other, you're not alone. "Uneven chest muscles are not only common, they're more normal than not," says Los Angeles-based personal trainer David Knox, author of Body School: A New Guide for Improved Movement in Daily Life." "It's just that the imbalance in the size and shape of the pectoral muscles may be more pronounced in some of us than in others." But most cases of uneven chest muscles can be remedied -- though it may take some work. The workout you choose to get a balanced chest depends on the cause. In some cases, the right and left pecs simply attach to the sternum at different points. That's just a matter of genetics, and while you can't change the point of attachment, developing a flat, sturdy chest is likely to make the disparity less noticeable. It's also possible that one pec is actually bigger than the other, probably the one on your dominant side, which naturally gets more of a workout in day-to-day activities. If there's a big difference between the size and shape of the two sides of your chest, the fault may lie in your workout. In that case, you can easily take corrective action. It's not unusual when working with barbells for your stronger arm to compensate for your weaker side. If your pecs are uneven, working out properly can restore balance. First, Knox advises examining your form. It might be a good idea to work with slightly lighter weight so you can be extra mindful of form and train your two sides to work together more harmoniously. When it comes to balancing the the dominate side of your body with its weaker side, dumbbells are a smart choice. Where barbells allow your weaker side to cheat, dumbbells keep both sides of your body honest. Choose chest exercises that allow you to work each side of your chest independently such as the one-arm dumbbell bench press, the dumbbell alternating front raise or one-arm push-ups. Evening out your pecs isn't, as the wise man says, rocket surgery. You can help the weaker side of your chest catch up simply by doing a few extra reps with the arm on the weaker side of your body. For example, if you're doing eight reps of an exercise, try adding three or four more to the weak side. Alternatively, you can choose dumbbell exercises that work both arms at once, such as the dumbbell incline bench press or the dumbbell bench press and add a bit more weight on the underdeveloped side. Or do both. Make sure you use a balanced grip. 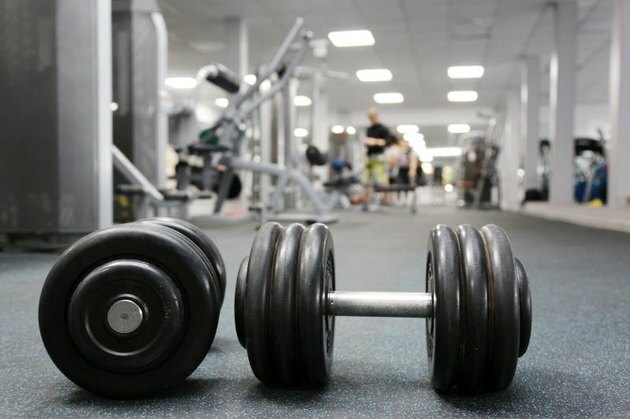 Where you grip the dumbbells affects the trajectory of movement, which in turn affects the muscles worked, so inconsistencies in grip and movement can lead to unevenness in the chest. Grasp the handles firmly in the middle with your thumb wrapped around the handle and your fingers curling over top of it, keeping your wrists straight throughout the movement. Injury can sometimes be the cause of uneven chest muscles by preventing one of the pectoral muscles from fully engaging during lifting. Or there may be hardened knots of muscle tissue that interfere with signals from the brain telling the muscle to engage. Deep tissue massage may help correct this kind of issue. It would be hard to find anyone in a gym who wasn't working on their pectoralis major, the largest of the chest muscles. That's why Apollo invented the barbell bench press, the pec deck and the bent-forward cable crossovers -- which coincidentally are the top three on the American Council on Exercise's Best Chest Exercises. But there are some smaller supporting muscles that should not go neglected if you want an even chest. Work the trapezius muscle that buttresses the shoulders with the barbell shrug. The "lats" (latissimus dorsi) at the rear of the ribcage help keep pecs tucked in. Keep them tight with lat pull downs. Finally, it's important to switch out chest exercises periodically because different motions work the muscles in somewhat different ways. What Type of Push-Up Works the Lower Chest?